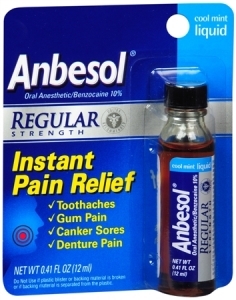 Temporarily relieves pain associated with the following mouth and gum irritations: toothache, sore gums; canker sores; braces; minor dental procedures; dentures. Adults and children 2 years of age and older: Wipe liquid on with cotton, or cotton swab, or fingertip. Apply to the affected area up to 4 times daily or as directed by a doctor/dentist. Children under 12 years of age: Adult supervision should be given in the use of this product. Children under 2 years of age: Consult a doctor or dentist. Allergy alert: Do not use this product if you have a history of allergy to local anesthetics such as procaine, butacaine, benzocaine or other 'caine' anesthetics. When using this product: avoid contact with the eyes; do not exceed recommended dosage; do not use for more than 7 days unless directed by a doctor or dentist. Stop use and ask a doctor if sore mouth symptoms do not improve in 7 days; irritation, pain, or redness persists or worsens; swelling, rash, or fever develops. Keep out of reach of children. If more than used for pain is accidentally swallowed, get medical help or contact a Poison Control Center right away.